This singularly beautiful second-class armored battleship was commissioned in 1895. She was then signed to the North Atlantic Squadron where she maintained East Coast operations until 1897. Having completed the appropriate training in Key West, she joined the forces developing off the Coast of Cuba, as the struggle between Spain and the revolutionary forces of Cuba heightened. She arrived in Havana on January 25th of 1898. Tragically, on the evening of February 15th, her entire forward part erupted in an explosion which ultimately killed 260 of the 350 aboard. Although she was raised for investigation in 1910, the true cause of the explosion was never resolved to everyone's satisfaction, and remains a mystery. In 1912 she was sunk with honors and ceremony in the Gulf of Mexico. 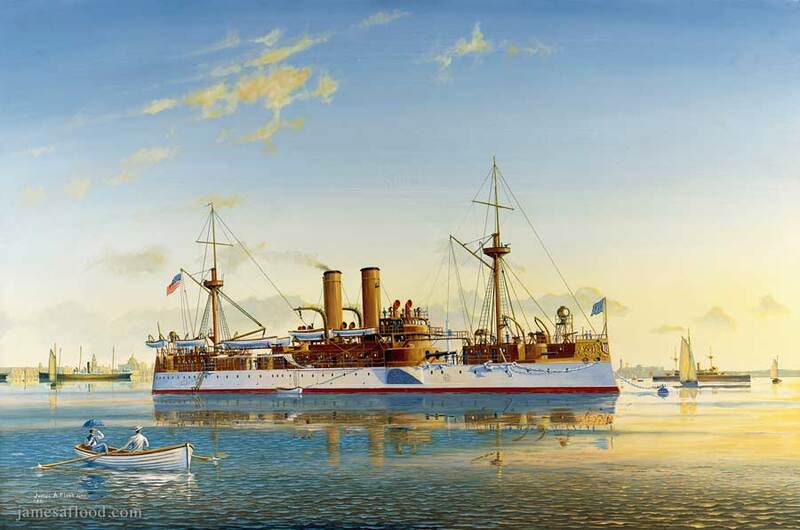 USS Maine is depicted here in this painting showing the flag at Havana in 1898 on the first morning after her arrival.